With the prices of new vehicles on the rise, many people tend to keep their cars longer by regularly getting it maintained and repaired. Whether you run an auto mechanic, body shop, or transportation repair business, you have a responsibility towards your customers of ensuring that their vehicles are in pristine condition when they leave your service shop. It is essential to work towards maximizing your insurance coverage and minimizing your risk exposures upfront. However, no matter how careful you are and sure about the capabilities of your employees, often times things do not go the way you intended. When the unexpected happens during or after your auto repair service, a well thought out insurance and risk management program can keep your business protected. That is why it is necessary to retain the services of a skilled and knowledgeable team that has considerable experience of working with clients in the auto repair industry. With our SIA Property & Casualty Insurance System, we take a proactive approach to insurance. It starts with a complete risk management analysis to fully identify the risks facing your auto repair business. Since 1978, we have a proven track record and extensive experience of successfully managing risk for auto repair shops of all sizes. In addition to catering to clients providing regular auto repair & body shop services, we also work with clients offering trailer repair, chassis repair, and reefer repair. Our expert team understands the auto repair business inside out, and the unique risk and loss exposures that need to be addressed. 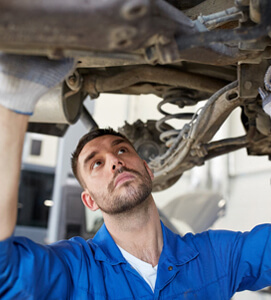 We will work shoulder by shoulder to identify and minimize your risk, and to craft a cost-effective, custom solution for your auto repair business needs. If you are seeking a proactive approach to insurance that is cost-effective for your auto repair business, please call us today at (630) 325-4000 to set up a time to complete your risk management analysis.